Gulkand Shrikhand Recipe Video | How To Make Rose Srikhand. 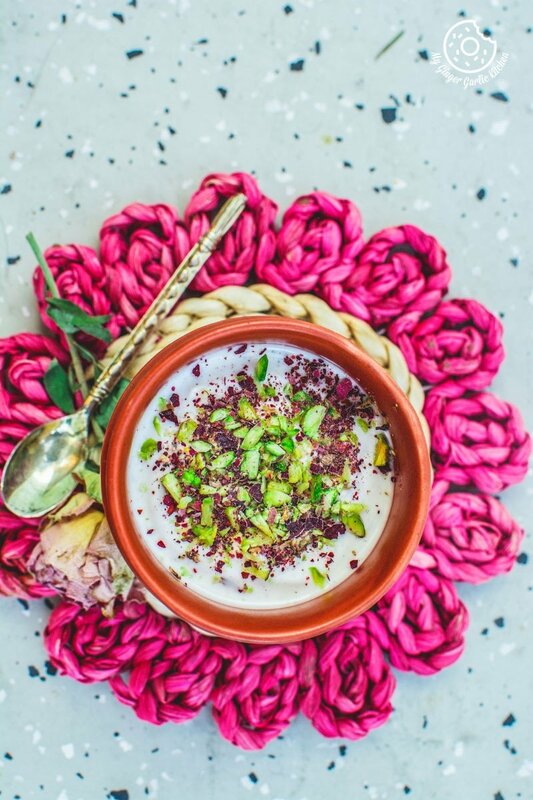 This is an Indian dessert made by using strained yogurt and flavored with Gulkand, rose water and cardamom. Serve with Poori, or just as a dreamy, creamy dessert after dinner. Both ways, it’s super delish. Happy FriYAY buddies! I have been waiting for this weekend the whole week, and I am so happy about the fact that this most awaited weekend is here. I know that you have probably guessed that I am very excited. 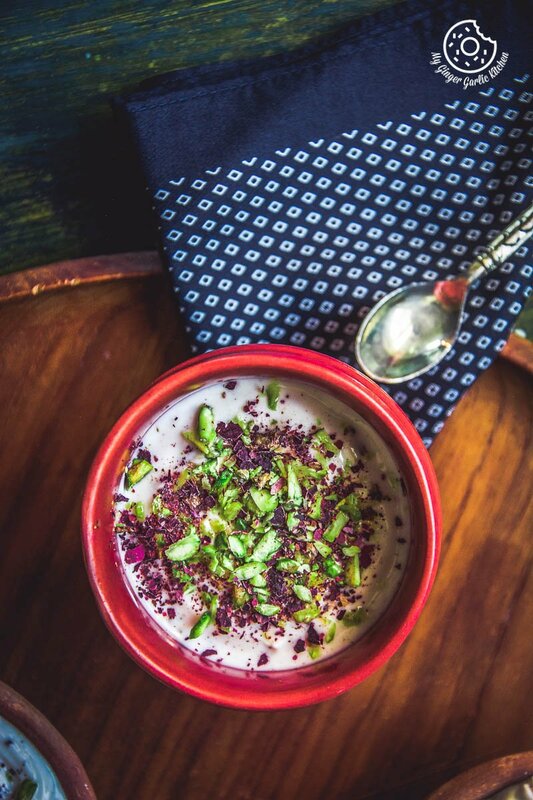 Yes, I am delighted because the weekend is here and also I am thrilled to be sharing this Gulkand shrikhand with you guys today, and for a few other reasons. Believe me, I have some good reasons to be ecstatic about this. Reason#1: This is because everyone knows that February is a month of all things sweet, rosy and pink. Reason#2: This month is my sister’s birth month and she likes shrikhand so so much. Reason#3: Basically, you don’t need any reason to enjoy yummy sweets like this shrikhand. Sometimes all you need is a bowl of something good-looking and sweet to eat. What is Gulkand? ‘Gulkand’ aka ‘Gulqand’ is a delightful rose petal jam made using rose petals. 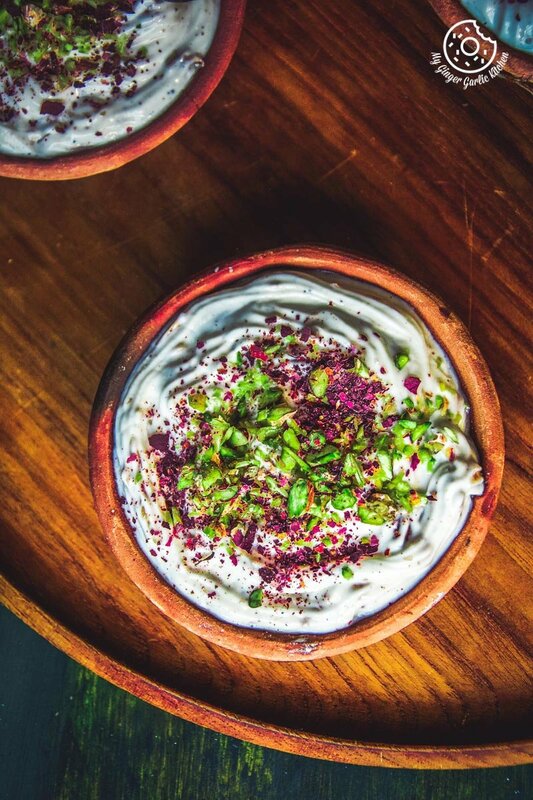 Gulkand is perfect for making summer desserts and drinks. It’s very intense and its rosy perfume will transform your desserts or drinks into a lavish royal delicacy. And that rich, sweet and oozing rosy flavor of gulkand is just beyond imagination. Luckily, you can create many dishes using this awesomely delicious and fragrant ingredient — Gulkand. Rose is known as ‘Gul’ in Hindi. And ‘Qand’ or ‘Kand’ is referred as something sweet in Hindi. So the combination of Rose and sugar is known as ‘Gulkand’. In ancient times Gulkand was considered a kingly and luxurious delicacy in India due to its laborious cooking procedure, and because of the use of the royal ingredient, the rose itself. Making gulkand at home is not very easy, but one can surely learn it. When I was a child my Granny used to make gulkand at home, and I just loved that pot full of sweet, fragrant and edible roses. Every time a spoonful of this royal sugar charge went in and I didn’t really need anything else as an evening dessert. 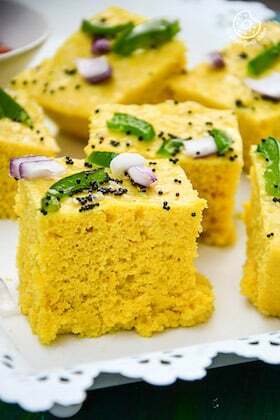 Gulkand is so versatile and perfect for so many different occasions. I’ve wanted to bring the gulkand with me for the longest time now but just hadn’t gotten around to it. During my last visit to India, I asked my Mom to make the same Gulkand for me, and she did make some real good ‘Gulkand’ for me. I ate plenty of gulkand as an after meal dessert there and I also brought a big jar along with me. I was just so thrilled by the thought of making desserts using this awesome thing. 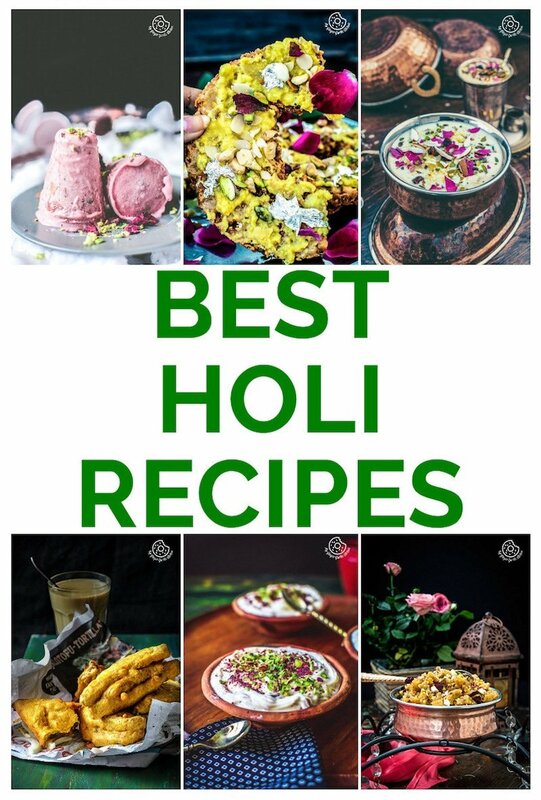 The Indian festival of colors Holi is nearing, and I am planning to share a series of gulkand dishes for this Holi. 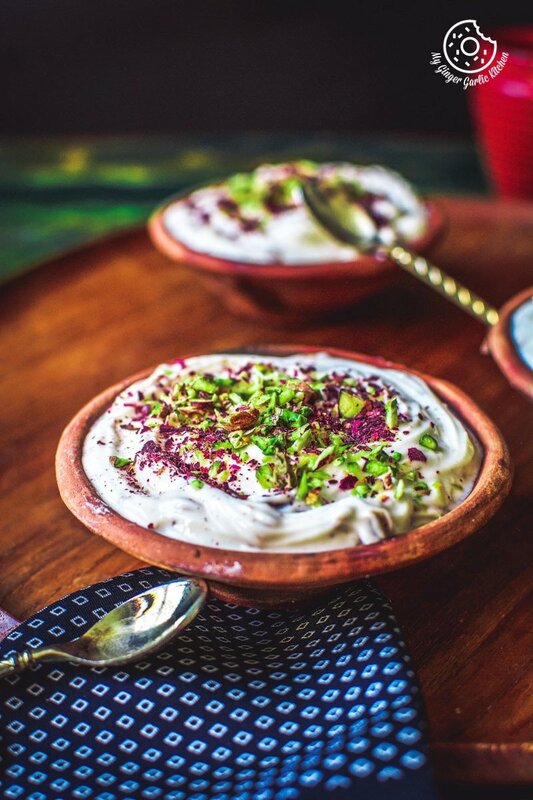 So this Gulkand Shrikhand is my first post in this Holi Gulkand recipe series. Stay tuned for my upcoming gulkand recipe series for Holi. 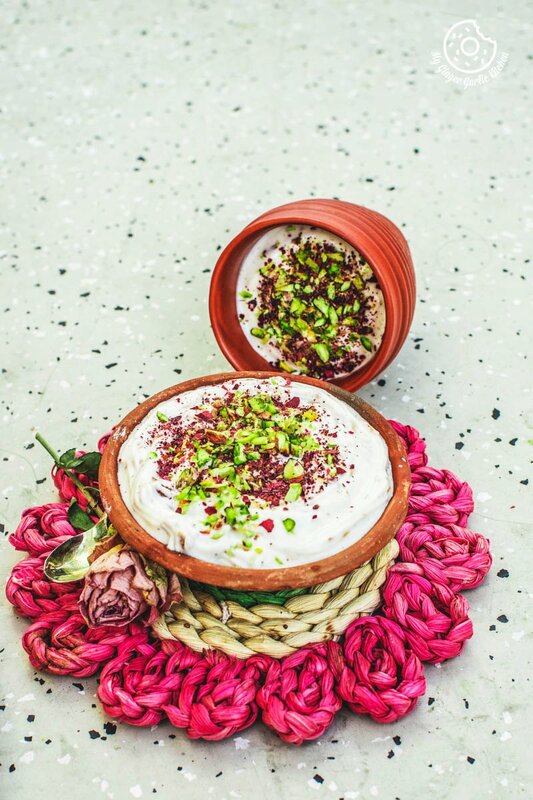 This gulkand is best for you if you are looking for a classic and innovative way to style your dessert and drinks. Or if you just want to overhaul your traditional or modern desserts and drinks? Shrikhand or Srikhand (श्रीखंड) is a sweet dish prepared by using strained yogurt known as hung curd aka matha or chakka. 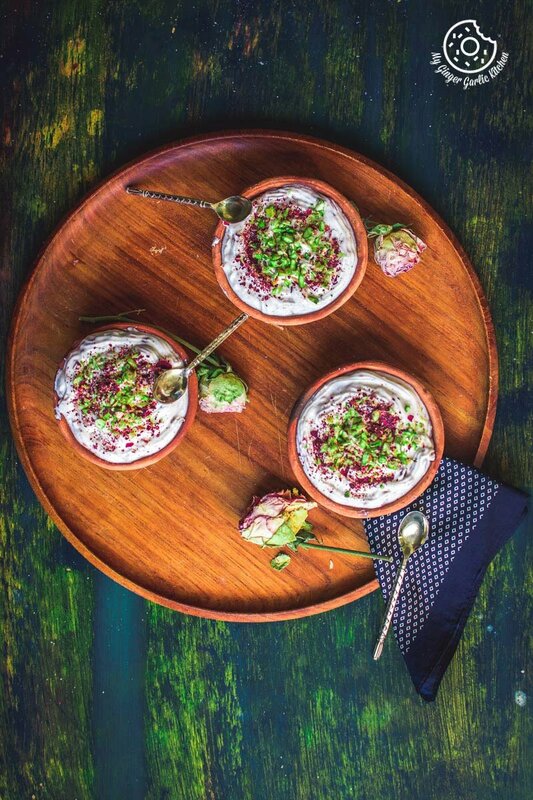 So ‘Gulkand Shrikhand’ or ‘Rose Shrikhand’ is a dessert prepared with strained yogurt, and flavored with gulkand, cardamom and rose water. 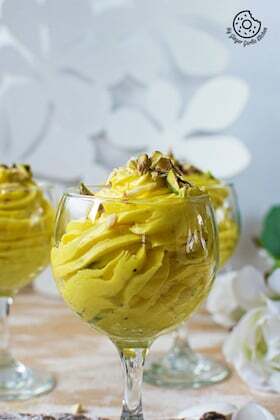 There are so many ways to flavor this yogurt dish, such as Kesar Elaichi Shrikhand, Mango Shrikhand and many more. 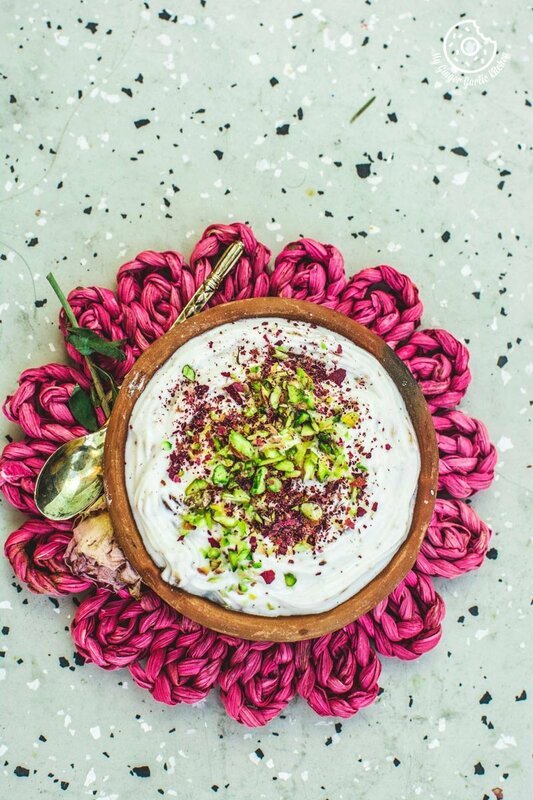 What you’ll need: Traditionally, Shrikhand is made using ‘puran yantra’, but this can easily be made by just using a wired whisk or an electric whisk. Simply tie yogurt is in a muslin cloth and leave it in the refrigerator overnight. This method will drain out all the whey and you will get the Chakka/Matha or Hung yogurt. Then you add, sugar, gulkand, rose water, and cardamom powder. Simply whisk in a deep bowl until sugar is dissolved and yogurt becomes creamy. Transfer into a piping bag and pipe into serving dishes. Garnish with pistachio and edible dried rose petals. Refrigerate for 1-2 hours. Serve with Poori, or just as a dreamy, creamy dessert after dinner. Both ways, it’s super delish. 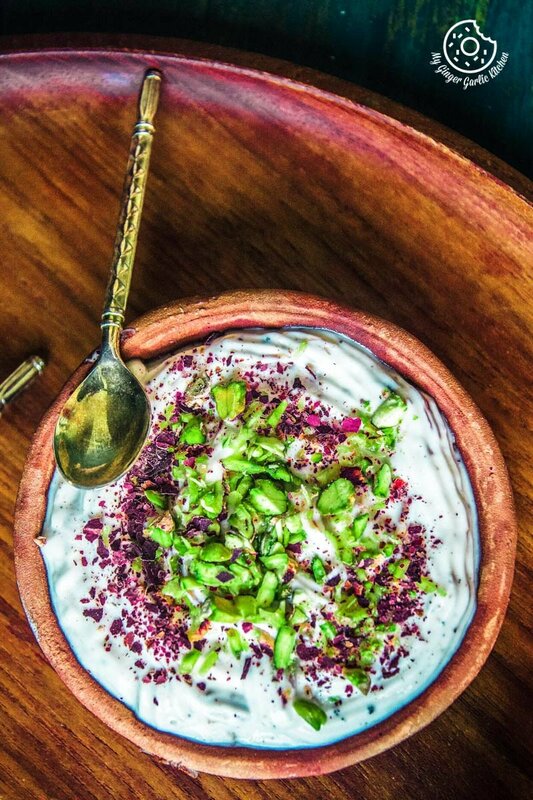 This is an Indian dessert made by using strained yogurt and flavored with Gulkand, rose water and cardamom. Serve with Poori, or just as a dreamy, creamy dessert after dinner. Both ways, it’s super delish. 1. Put a strainer over a large bowl. Take a muslin cloth and spread it on a strainer. 2. Pour yogurt into the cloth and bring edges of cloth together and put some weight on top. 3. Refrigerate for overnight, this will remove excess whey. 4. Hung yogurt is ready. 5. Transfer hung yogurt to a large mixing bowl. 6. Add sugar, rose water, cardamom powder, gulkand and whisk well until sugar is dissolved and yogurt becomes creamy. 7. Pour it into a piping bag and pipe into a serving glass or bowl, or simply pour it into a serving dish. 8. Garnish with pistachios, and dried rose petals. 9. Chill for 2 hours before serving.